Einstein called it in 1916, but until this month no one was able to prove it. On Feb. 4, a group of more than 1,000 scientists confirmed they detected gravitational waves after decades of searching. 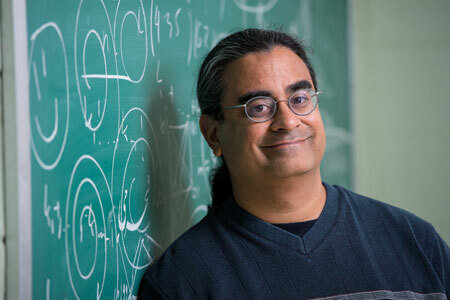 Sanjeev Seahra, professor of mathematical physics at the University of New Brunswick, will deliver the free public lecture about this discovery on Tuesday, Feb. 23, at 7 pm in Room 146 of Bailey Hall, UNB Fredericton. News stories about Einstein’s ripples recently dominated international news and according to Dr. Seahra, the news lives up to the hype. "The direct detection of gravitational waves represents a huge leap forward,” said Dr. Seahra. “Objects that were previously invisible to us can now be seen with these ripples of space and time. This means we can observe some of the most exciting and violent events in the universe, like the merger of black holes." Dr. Seahra will discuss what gravitational waves are, how they are produced, and the painstaking efforts of a huge team of scientists to observe them. Dennis Tokaryk, a physics professor at UNB Fredericton, will also demonstrate a working miniature version of the instrument used to make the discovery. For more information, contact UNB Fredericton’s department of mathematics. Join the conversation at #UNBgravity.